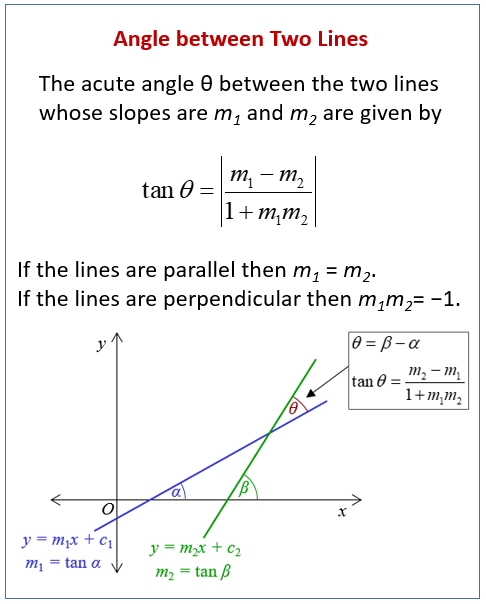 The following diagram gives the formula to find the angle between two lines. Scroll down the page for more examples and solutions. How to find the angle between two straight lines? 1. Find the acute angle between y = 2x + 1 and y = -3x - 2 to the nearest degree. 2. Find the acute angle between 3x - 2y + 7 = 0 and 2y + 4x - 3 = 0 to the nearest degree. 3. Find the acute angle between y = x + 3 and y = -3x + 5 to the nearest degree. How to find the angle between two lines using the formula?